tags: As They Roared Into Battle, Only One Thing Was Missing...The Enemy! Hysteria grips California in the wake of the bombing of Pearl Harbor. An assorted group of defenders attempt to make the coast defensible against an imagined Japanese invasion, in this big budget, big cast comedy. Members of a Japanese submarine crew scout out the madness, along with a Captain in Germany's Kreigsmarine (Navy). Hysterical Californians prepare for a Japanese invasion in the days after Pearl Harbor. Probably the best way to describe the majority of the movies I saw as a pre-teen at the advent of cable in the early eighties. "Back in the day" when cable didn't have a zillion choices of non- fiction b.s. shows to choose from, they just showed movies. Movies like Cool Hand Luke (A+) and Five Deadly Venoms (A+++), and now in this year 2008 a movie like 1941 fits so well in this vein (well Paul Newman's classic exceeds this flick but you get my gist). These were movies that made you wonder, like 'what the hell is this thing..." And you were happy to have managed to eek out afternoon watching this movie though you probably should have spent your time more productively. I do say the lawn can wait to be mowed for a few minutes longer..."Mom just let me finish watching this one thing..." (vintage quote from 1983) In the documentary that accompanies this director's cut version, now available on DVD, Spielberg makes the comment that he agreed to direct 1941 for the simple reason that he didn't have anything better to do at the time. It was an attitude that didn't bode well for the film, and the final result was one of the most horrific critical and box office disasters of the late 1970s: a film that opened with tremendous hype one night and all but vanished from theatre screens the next. I did not see the original release, which I understand was quite a bit different from this director's cut, so I can't say if I find the present version better or worse. But I can say it isn't as bad as you may have heard. (Indeed, in some respects it is better than most Spielberg films, for it generally lacks the ham-handed sentimentality so typical of his work.) All the same, I can also say that it isn't as good as some would have you believe. As slapstick comedies go, it is only incidentally funny. The premise is intriguing. In the wake of Pearl Harbor, Californians have fallen prey to the fear that they will be the next attacked--and that fear spawns an increasing paranoia. 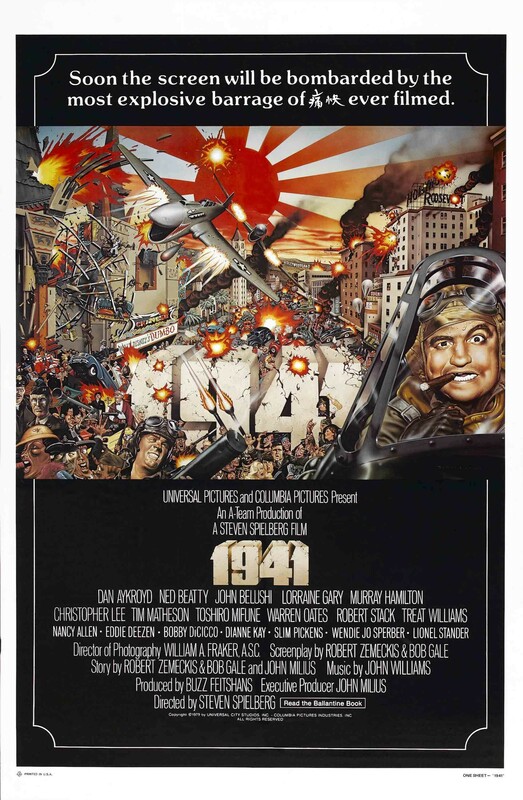 If the writers (and Spielberg himself, who apparently egged them on) had focused on this, 1941 might actually have been a truly memorable comedy... but instead the film rips and snorts in every direction imaginable in an effort to cram in everything from riffs on DR. STRANGELOVE to the Los Angeles "Zoot Suit Riots" to expensive special effects pratfalls that are only mildly amusing at best. The plot inevitably splits into several different directions, and the result is rather like IT'S MAD, MAD, MAD, MAD WORLD meets ANIMAL HOUSE and the two do a belly flop into a bucket of Hollywood gloss--but without making much of splash. Many of the individual performers are quite good (Slim Pickens, Ned Beatty, and Treat Williams particularly so), and many of the situations have tremendous potential. But in the final analysis, 1941 is the sort of film that you don't bother to pause when you go to the bathroom. That said, the DVD package is quite nice: the film looks good, and I was particularly impressed with the sound. There isn't a director's commentary track, but there is a rather lengthy "making of" documentary that includes extended interviews and home-movies taken of the set that provide behind-the-scenes glimpses of the cast, most particularly of the late great John Belushi. Fans of the Spielberg style will likely adore the whole thing, but for rest of us... this is a rental you won't mind returning the next day. Whether you finished watching it or not. Gary F. Taylor, aka GFT, Amazon Reviewer 1941 represents an appalling waste of filmmaking and performing resources. As one would expect, Spielberg, who directed "Jaws" and "Close Encounters of the Third Kind," sustains a high energy level. But the energy is expended on material that is pointless at best and occasionally hateful. [15 Dec 1979, p.C1] The Director's Cut of this early Spielberg flick runs approx. 27 minutes longer than the old Theatrical Version and features several blocks of new scenes throughout the time. Nearly 27 scenes were added or altered and sometimes alternate material was used as well.